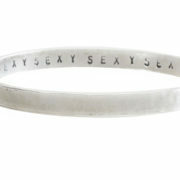 The silver personalised Message Bangle is the ideal gift for someone special – that's including you!. The unique simple Message Bangle is ideal for both men or women and you can have your own personalized message stamped on the inside. Your message can be up to 65 – 80 characters long depending on the size of the bangle and the text is then oxidised (blackened) to be easily read. Both letters and numbers can be used together. Just click on any of the images for a more detailed look. 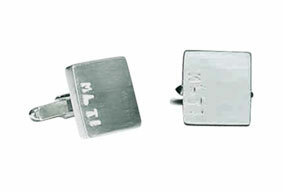 Choose a message to be stamped. Max length 80 characters. 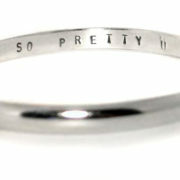 The silver personalised Message Bangle is custom stamped with your own personal message on the inside. 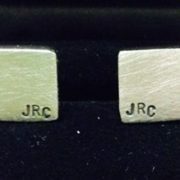 The personalised message can also be stamped on the outside by request. Your chosen message can be as simple or as outrageous as you like. Email me with your ideas because I can help if you’re unsure of what you’d like to say in your message. Choose from a D shape (rounded) bangle which is 6mm x 3mm or a flat (straight) bangle which is 6mm x 2mm. The Message Bangle can be made for any wrist size and can be adapted into a C shape bangle for people with large hands but little wrists, some men usually prefer a C shape bangle. 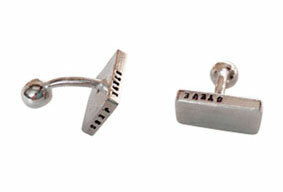 You can also select a prefered finish, polished (shiny) or matt (brushed). Other variations of my silver peronalised Message Bangle can be created too, for example, I can add diamonds or semi precious stones, also I can make a message bangle with gold instead of silver, email me for details & prices on these designs. 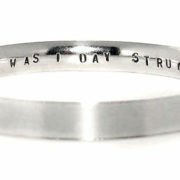 Click on the images to see other designs including my Flat Message Bangle asnd a C shape Message Bangle. 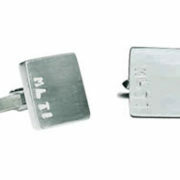 If a Message Bangle isn’t for you, try my silver Message Cuff Links, choose your preference from the drop down menu. You can go to my COMMISSIONS page for more details of a Silver Personalised Message Bangle with Diamonds. The lettering I use is best described like an old typewriter font, slightly disjointed and uneven – and in capital letters. 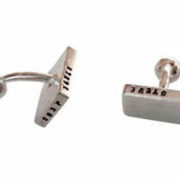 The price of £105 is for a single Silver Personalised Message Bangle or for a pair of message Cuff Links and as with all my work has free UK delivery. Perfect for 18th and 21st birthdays. My daughters and god daughters all have one – beautifully personalised with individual messages. Thank you, if I remember correctly, one of your Message Bangles has diamonds set in too. 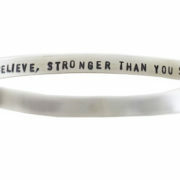 we were not sure about what message to put on the bangle but with the help in your shop we came up with a really pertinent one. Thank you so much. Yeah, Rochelle is really good at helping make the messages more interesting and inspiring. sssshhhh. Let’s just keep the secret between you and I then eh? Personalised – Professional – Perfect!